Google has long been pulling various APKs from stock Android and putting them into the Play Store. And, the latest to make the leap from part of the system to being decoupled and added to the Play Store is the stock Android keyboard. Even better, the app is available for any device running 4.0+, which means the number of devices compatible with the gesture typing feature has just gotten much much bigger. The idea here is two-fold: first, apps can be updated faster and more easily when decoupled from the system; and, second, anyone with access to the Play Store can get an app, meaning even if you have a device with a heavily modified version of a Google app, you can still get the stock version. So, if for some reason you don't like Samsung's Calendar app, Google Calendar is in the Play Store, or if you don't like HTC's keyboard, you can now get the stock Android keyboard. The Google Keyboard brings all of the features you would expect including 26 language dictionaries, autocomplete, next-word suggestions, gesture typing, voice dictation, and advanced keyboard layouts. There is emoji support, but it's a bit wonky because you need to type the word (like "smile") then choose the emoji from the suggestions. The app will also scale to run on any device, phone or tablet. As we said before, you'll need Android 4.0+, but at least you don't need to wait on Android 4.2 to get gesture typing. 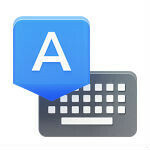 If you want to give it a try, the Google Keyboard is available for free in the Google Play Store. I wish it had the top row of number keys like the Samsung GS4 keyboard. The gs4 keyboard, though doesn't auto correct. That's even worse. I got the JellyBean keyboard out of the Play store to fix both problems. Though I had to pay a few bucks to get the PRO version that allows the top row of numbers. Awesome keyboard. I've been using the one in the GP store that's free ever since it came out. There's no difference except the vibration isn't as strong on the Google keyboard as it is on the other app and the spacebar always shows the language you're using. Google got a 5 star rating from me. One great move on their part. Only root users got to enjoy this kind of suff in the past. There was actually an unofficial port in the Play Store before, but I agree, this is great. I somewhat confirm this. It's nowhere to be found from my phone. But if its not available worldwide, there is one called "Jelly Bean Keyboard" or "Ice Cream Sandwich Keyboard" both by JohnTanmi which is the one they were talking about above. No worries. Like @ PapaSmurf said above, the only difference is that the tactile vibration isn't as strong as the google keyboard. Even though I'm sure you don't even have the app, I checked and they are actually included. Now this is what I call an irony. Everytime I install an AOSP-based ROM on my phones, I get rid of the AOSP keyboard and install the Xperia Keyboard. To each his own, right? even though there are keyboards out there in store but many are not free..google keyboard is free with all functionalities. But will we ever get a dedicated emoji list? Idk why but I can't even see emoji anymore and I have a GS4. 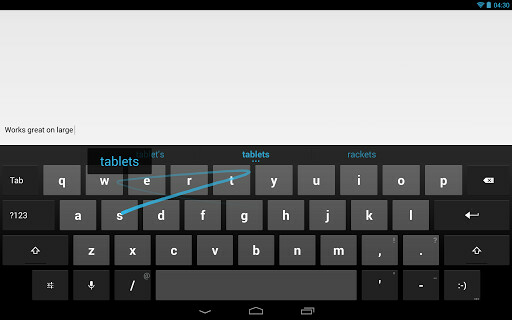 Still sticking to SwiftKey as my landscape keyboard. Going to give the Google keyboard a try as my portrait keyboard. Currently, I'm using Swype as my portrait keyboard. i just so happened to find this while i was getting all the Google apps i needed for my DNA and i was happy to find it because i'm not a big fan of the Sense 4+ keyboard. i can't wait for Moonshine S-Off to finally be released because as soon as it does this baby is getting unlocked and Sense 5 is getting flashed. My phone has a 3.5' screen and this is still a bit too cramped for me. Swfitkey remains the best keybord for me. When I reach the 4' club i'll use the stock keyobard. Gingerbread has been dropping consistently for months, and won't be the biggest part of the ecosystem by next month. Don't develop for the past, develop for the future.